Compare prices on car hire in Lannion from all the major brands and find the best deals. When you book through us, unlimited mileage and insurance are always included in the price given. 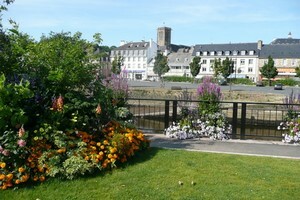 Lannion is located in Brittany, northwestern France. The city is located in the Cotes d’Arrmor Ministry. Approx. 60,000 residents live in the city which lies 96 km northeast of the port of Brest. The city’s old town draws more tourists here. Here is Brelevenez church, several chapels and frescoes. The church was built in the 1200s by the Templars from Montjoie. The church is located a few hundred meters north of the center. The church tower was built in the 1500s and is in the Gothic style. It is held in the chapel kunstutstillingerr Ursulines, La chapelle des Ursulines, and pavilion Louguivy, Pavillon de Louguiv. In the chapel of St. Anne, La chapelle Sainte Anne, in 1902, held concerts and theater performances for up to 300 people. There are good opportunities for both sjøkajakk and rafting in Lannion. It is also good cycling conditions. The nearest airport is Lannion – Côte de Granit Airport approx. five kilometers off the city of Lannion.